The conceptual framework for kitchen appliances is based on the internalization of human technology relationships. Technologies such as the toaster and blender become part of human rituals and routines, which have their own laws (such as do not put your hand in toaster or blender). Technology is a part of human socialization and the process of unlearning social norms can be difficult. Kitchen appliances are transformed by changing their context--socially, spatially, and functionally. The toaster and hand blender are meant to provoke thought about how people relate and depend on technology. The toast-her-hand is a device that writes basic reminder notes to/on the user. To operate it one types in reminder notes on a keyboard (which is connected to your toaster), they stick their hand into the toaster (where you would normally place the toast) and push down to print. You will receive a print of your note on your hand in red, black or blue non-toxic ink. This concept was expanded to include a typewriter with a similar function. In the typewriter scheme one would type directly onto their hand. The blender massage machine is a technology, which looks like a blender but is used to massage hands in the office, which are tired from typing and other tasks. You can use a pair or a single blender. They also come in a variety of sizes and colors to match office décor. To operate you stick your hand into the blender (with or without "smoothie lotion") and turn the blender on mix, liquidize or pulse, depending on the level of massage you need to relieve your stress. Both play on the human desire to avoid pain and discomfort; although most people have not actually put there hands in a blender and turned it on. It is interesting in that is poses the question of if people like the initial feeling of discomfort that they feel before they stick their hand in the blender, followed by the pleasant massage. The perspective of Reflective Design offers the designer the opportunity to reappropriate common themes for unusual purposes. One theme that we encountered repeatedly was that of repurposing kitchen appliances. 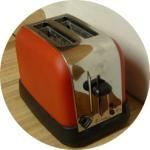 The "Toasted" Clock represents an intersection between our interests in timekeeping and appliances. The "Toasted" Timer would consist of a traditional-looking toaster, with a clock face instead of light/dark settings. In order to set it, the user would insert a piece of "toast" and set the timer to the desired trigger time. At the specified time, the toast pops up with the word "TOASTED" printed on it. This appliance might serve as a generic timer; however, the implication of being "toasted" suggests that users might use it to time the workday. How does an appliance's setting change expectations of function? How does a human-technology interaction set the "scene" for future interactions? How is one interaction generalized to future ones?